The Beacon voltage detector is designed for indoor and outdoor use. The unit is a capacitive type instrument and does not require a ground lead, thus greatly reducing the risk to the operator caused where fault potential can be grounded. Beacon voltage detectors have visible and audible detection. The units are simple to use and incorporate a self-test facility. 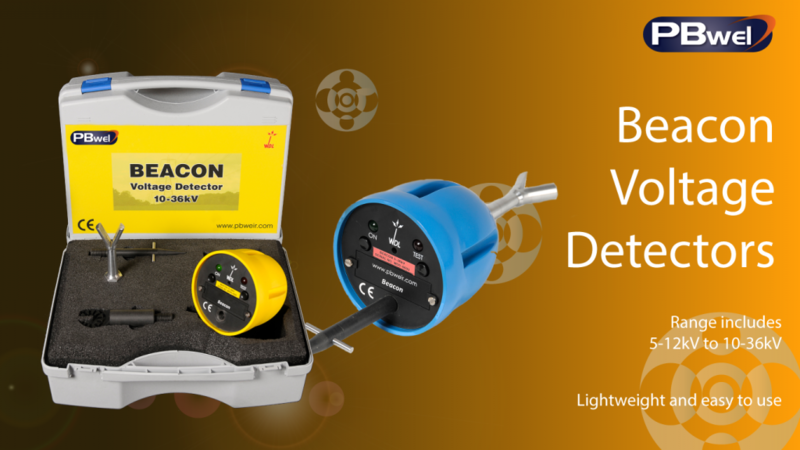 The Beacon voltage detector is available with ranges of 5-12kV and 10-36kV. The circuitry is housed within a durable plastic moulded body. The sounder, LED’s, ‘ON/OFF’ and ‘TEST’ buttons are mounted on a fascia plate facing the operator. The unit is simple to use and incorporates a self-test facility which confirms the operating circuit prior to use. A durable case is supplied to transport the unit, its contact probe and pole fitting. As standard, each unit is supplied with a standard castellated fitting suitable for use with standard castellated pole heads. Also supplied is a long tapered type socket fitting for use with standard OLE clamp operating pole heads. A ‘Y’ type contact probe is also supplied as standard. Other fittings are available upon request.